Crafted in highly polished 14 Karat white gold, 0.17 Carat t.w. 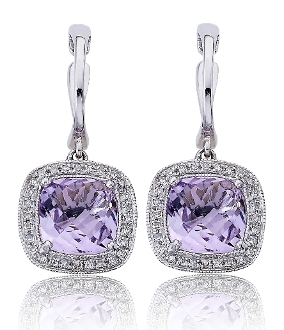 pave Diamonds frame a prong set cushion cut light purple Spinel. Considered to be one of the rarest gemstones, and formed in ancient metamorphic rock and molten lava, these spinel earrings sparkle beautifully showcased in a pave Diamond flower basket back setting hanging from a polished petite white gold latch back hoop.